If you’re looking for a Sacramento Whiskey Bar, look no further than de Vere’s Irish Pub! Our growing collection of whiskys include many rare and allocated whiskeys that you won’t be able to find anywhere else. Wednesdays are a perfect time to explore our Whiskey Wall. 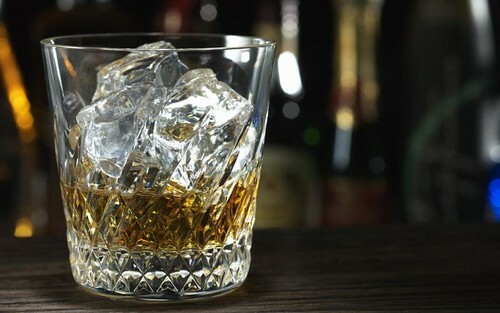 After 7pm each Wednesday ALL of our whiskeys are 50% off! We want you to come in and treat yourself to a pour from that bottle you’ve been meaning to try. At half off, there’s never been a better time to grab a friend and head down to the pub to go on a whiskey adventure. Our extensive whisky list includes Irish, Tennessee, Japanese whiskeys.Scotch, bourbons and ryes available as single pours or as part of our Whiskey Flights. Check out our whiskey library online for a list or stop by the pub to see our latest offerings. You can enjoy our Whiskey Wednesday savings at both our Sacramento and Davis pubs! We believe that de Vere's Irish Pub has the best Irish Coffee around. Press play to see what all the buzz is about! The Irish Coffee Challenge is not just for anyone–it’s for those who take coffee, whiskey, and road trips seriously. de Vere’s Irish Pub challenges you to compare their Almost Famous Irish Coffees to the world famous Irish Coffees at The Buena Vista Cafe in San Francisco–and tell us which one you like best! Why? Our regulars often comment on how incredible our Irish Coffees are and almost always reference the Buena Vista’s in the same sentence. So we created this experience to allow people to vote on their favorite Irish coffee. The challenge is simple, and requires a small journey, but will lead to the discovery of the best Irish Coffee. You’ll need to order Irish Coffees at both establishments, take pictures of your challenge experience, and secure a sober driver. Are you up for the challenge? Take our Irish Coffee Challenge! Tickets are just $10, plus processing fees. St. George Distillery is coming! Calling all whiskey, rye and bourbon fans! We invite you to kick off National Bourbon Month at the pub with a St. George Distillery tasting and education session! Experience their Breaking & Entering Bourbon, Dry Rye Gin and Single Malt Whiskey with a distillery expert and fellow whiskey enthusiasts--all for just $5. For more info on St. George Distillery spirits, go to www.stgeorgespirits.com. Only 30 spots are available, so snag your tickets ASAP! de Vere's Whiskey Dinners were recently featured on KCRA news and in the July issue of Sacramento Magazine! Pick up an issue to read the full "44 Hidden Gems" cover story, and click the image below to view the video. Sacramento St. Patrick's 2012: Let the Session Begin! After three successful St. Patrick’s Day events, it’s become apparent that de Vere’s Irish Pub has outgrown a one-day celebration. So this year, we’re dedicating an entire week to our favorite holiday! From Sunday, March 11th to Sunday, March 18th, we will be hosting eight unique and authentic events, all of which will be free to the public. To boot, we will be offering exclusive food and drink specials throughout the week. Being the only Irish-owned and Irish-run pub in town, we want to make sure we give everyone in the community an opportunity to celebrate St. Patrick’s and experience our pub in their own way. This year, you can be mellow throughout the week with traditional fare and a pint or join the madhouse on St. Patrick's Day for a truly festive time. Let the session begin! Whether you were a runner or just a spectator at the Shamrock’n Half Marathon (we won’t judge! ), come recover and carbo load at the pub. We’ll be serving up a full brunch, compete with our Almost Famous Irish Coffees, bottomless champagne bottle service, and Bloody Mary’s to help you wind down and loosen up those muscles. We’ll even have lemon-lime Gatorade to help you refuel, festively! How much money would it take for you to shave your head? What if all that money went to making a difference in the lives of children battling cancer? That’s what St. Baldrick’s Day is all about—going bald for a good cause. Come shave your head—and collect donations for doing so—or watch others get buzzed bald. We have partnered with the Keating Raphael Memorial to host another successful St. Baldrick’s event. All money raised will benefit the St. Baldrick’s Foundation. Come grab a beer and get your St. Pat’s gear! Pre-order their St. Patrick’s 2012 t-shirts (custom designed by de Vere’s) between now and March 13. Then come pick it up and have a pre-St. Pat’s pint at the pub! Order your t-shirt in advance so you won’t be caught without your green! By now you’ve probably heard we have the biggest whiskey offering in town, so why not come take advantage of it? On the fourth day of St. Pat’s week, join our in-house experts and ambassadors from various whiskey labels for whiskey tastings, education, and cocktails featuring our favorite spirit. From 6pm-8pm, you’ll be able to bounce around multiple tasting stations while expanding your palate and taking advantage of 50% off Whiskey Society memberships if you so choose. Enjoy 2 tastes for $5 and 5 tastes for $10. The big day is finally here! Doors will open at 8am and the Ireland vs. England rugby game starts airing live at 10am! There is truly no better place to celebrate St. Patrick’s Day than at de Vere’s, the only Irish-owned and Irish-run pub in Sacramento. Plus, there’s no cover! Come celebrate in true Irish fashion--and don't forget your green! St. Patrick’s Day might be over, but that doesn’t mean the festivities have stopped! Whether you overdid it on Saturday and need a place to recover, or you stayed in to avoid amateur hour, come join us for a family friendly brunch featuring good food, live music, and more. Davis St. Patrick’s 2012: Let the Session Begin! Get excited…we’re throwing their first-annual St. Patrick’s celebration in Davis this year! Instead of a one-day celebration, we’re dedicating an entire week to our favorite holiday. From Monday, March 12th to Sunday, March 18th, we will be hosting seven unique and authentic events, all of which will be free to the public. Additionally, we’ll be offering exclusive food and drink specials throughout the week. By now you’ve probably heard we have the biggest whiskey offering in town, so why not come take advantage of it? On the third day of St. Pat’s week, join our in-house experts and ambassadors from various whiskey labels for whiskey tastings, education, and cocktails featuring our favorite spirit. From 6pm-8pm, you’ll be able to bounce around multiple tasting stations while expanding your palate and taking advantage of 50% off Whiskey Society memberships if you so choose. Enjoy 2 tastes for $5 and 5 tastes for $10. How much money would it take for you to shave your head? What if all that money went to making a difference in the lives of children battling cancer? That’s what St. Baldrick’s Day is all about—going bald for a good cause. Come shave your head—and collect donations for doing so—or watch others get buzzed bald. De Vere’s has partnered with the Keating Raphael Memorial to host our first-ever St. Baldrick’s event in Davis. All money raised will benefit the St. Baldrick’s Foundation. The big day is finally here! Doors will open at 9am and the Ireland vs. England rugby game starts airing live at 10am! There is truly no better place to celebrate St. Patrick’s Day than at de Vere’s, the only Irish-owned and Irish-run pub in Davis. Plus, there’s no cover! Come celebrate in true Irish fashion--and don't forget your green! St. Patrick’s Day might be over, but that doesn’t mean the festivities have stopped! Whether you overdid it on Saturday and need a place to recover, or you stayed in to avoid amateur hour, come join us for a family friendly lunch featuring good food, live music, and more. Sign up now! Spots are limited. Phil Giammona, Ambassador Heaven Hill Distillery, will be sharing legendary bourbons, such as Henry McKenna Single Barrel, Evan Williams Single Barrel, Elijah Craig 12yr. and 18yr., and possibly more. $15 includes education, tasting, and light appetizers. Michter’s US 1 Four Stars/Highly Recommended F. Paul Pacult's Spirit Journal: "The rich bronze color sparkles under the lamp; perfect purity. The initial whiffs uncover dry notes of stone-milled grist and dried fruit; following the aeration stage, the bouquet offers peppery/spicy scents that accent the dry graininess. The palate entry is surprisingly sweet and corny, considering how dry the aroma is; the midpalate point is deep, corny sweet, sap-like and a bit syrupy. Ends up well and balanced, with a backnote of dried red fruit (raisins, prunes). A handsome addition to this series." You can try this Whiskey at de Vere’s Pub in downtown Sacramento. Join our Whiskey Society to learn more about Whiskey's at a discount! Our management staff at de Vere’s Pub is dedicated to building Sacramento’s largest whiskey list. We add whiskeys to our list as often as possible, in order to offer our guests the best and most comprehensive assortment in Northern California. To further educate our patrons (and ourselves), we like to post reviews of these whiskeys on our blog. This lets our guests read up on the whiskeys we offer before coming to visit our whiskey bar—which we know you’ll fall in love with upon your first visit. The whiskey bar is located in the back room of our Irish Pub in downtown Sacramento, which is owned and operated by an Irish family. We understand that you have a lot of choices in the bars and restaurants that you frequent in the Sacramento area, and we hope that we can earn your patronage by providing you with a one-of-a-kind experience. Our goal is to provide you with the best place in town to eat, drink, and socialize with your family and friends. So, grab a friend and come down for an incredible whiskey and dining experience! In honor of national Bourbon month, de Vere's Irish Pub will be posting some of our Favorite Bourbon blog posts from around the web for you to enjoy! Every once in a while something that sounds crazy in a cocktail actually works, if you are open to the idea. 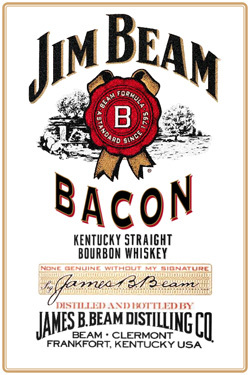 One such concept is Bacon Infused Bourbon. It’s seems ridiculous at first, but when you consider sweet caramel and maple syrup flavors sometimes characterize a good bourbon, you start to think about breakfast and how a side of bacon tastes so good next to your pancakes! Does it still sound silly? Well, maybe if I break it down a bit, it will make a little more sense. What we are talking about is neither sweet nor sour, not salty or bitter—it’s the fifth fundamental flavor that the Japanese call umami. Umami, or savoriness, is considered by eastern cultures as an important component of taste in their cuisine. It is the flavor produced by amino acids such as glutamate that we normally associate with beef, mushrooms or that “rich” character found in stews and some fermented foods. Although it isn’t often discussed in regular western culture, umami is widely recognized as a flavor descriptor in the culinary world. Naturally, ideas born in the kitchen can be carried over to the bar, and that’s what we are doing here. In addition to capturing rich meaty flavors, the smokiness that typifies cured bacon is equally important in our infusion. That is why I recommend finding an extremely smokey bacon to start out. You can pick any bacon that you like, but the stronger the flavors the better. Benton’s Smoked Country Bacon is supposed to be very good for this. I used a delicious smoke house bacon I found at our local farmers market. It’s a thick-cut, organic product that is absolutely wonderful as a breakfast side, in an egg casserole or sprinkled over fresh salad greens. 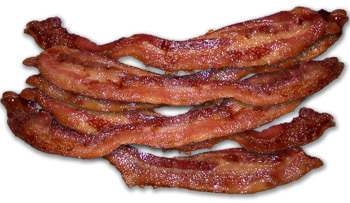 Whatever you use, plan to eat a good, healthy portion of bacon, because all we need is the fat! That’s right, the process of infusing umami into bourbon is called fat-washing. The idea is simple. Cook your bacon as you normally would and reserve the rendered fat. You need about a third of a cup of fat for the process. Place it into a jar while it’s still hot, and fill the jar with bourbon. Let it cool, then freeze it for 24 hours. Filter it and you are done. It’s that simple. Cook a pound of bacon and reserve the rendered fat. Add .33 cup of hot fat to a jar and fill with bourbon. Seal and allow to stand until it reaches room temperature. Place the jar in the freezer for 24 hours. The fat will solidify but the bourbon will remain in a liquid state. Open the jar and pour off the bourbon, straining through a coffee filter or cheesecloth to remove any loose fat particles. Bottle it and slap on a cool label. If you’ve done other infusions with vodka, the basic principles are the same. The high-proof spirit draws flavors from the fat into the alcohol. Over the course of a few hours, the cooling fat solidifies and allows complete separation from the booze. Using the freezer is a neat trick because the alcohol works as an anti-freeze for the bourbon making the separating process even easier. There are a few tricks I learned that can streamline the process. First, don’t shake the jar while the fat is cooling. This will create an emulsion and the fat will have trouble coagulating. It will separate eventually, but there will be microscopic droplets that will make the bourbon cloudy, and even freezing and filtration will have a hard time clearing them out. Second, it can help to tip the jar on its side. This will make it easier to pour off the bourbon later so you don’t have to break through a solid fat cap. Finally, don’t worry so much about the proportions. You can use as much fat as you like. In fact, if the flavor isn’t strong enough or you picked a mild-flavored bacon, you can run the bourbon through the process multiple times to improve it. In a mixing glass filled halfway with ice, combine all ingredients. Stir, then strain into a tumbler with one large ice cube. Garnish with a twist of orange. I have also used Urban Moonshine’s Maple Bitters in this drink to good effect, but Angostura has a wonderful clove-like component that makes me think of glazed ham. If an Old Fashioned is not your thing, don’t be afraid to experiment. It’s hard to separate the idea of salt in your mind when you ponder ideas with bacon, but think about how well ham pairs with spices—or with sweet flavors like honey and brown sugar—and you will start to see its potential. Perhaps a variation on the Manhattan is more to your liking. This one is especially good if you used a very smokey bacon in your infusion. It also contains Pimento (allspice) Dram, which is a liqueur made from allspice berries (not red pimentos!). The liqueur used to be impossible to find without making a drip to Jamaica, but thankfully, St. Elizabeth’s Allspice Dram is becoming more readily available. If you have a choice, buy the small bottle. The spicy flavor is potent, so most recipes call for small amounts. Combine ingredients in a mixing glass and stir with ice until chilled (30 seconds). Strain into chilled cocktail glass and serve. 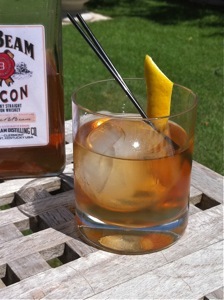 For another version of a bacon Manhattan, check out the one Nick Kosevich created for the Town Talk Diner." Check out the Original Article is from Summit Sips these folks know their Coctails! "Thanks to our friends over at Small Screen Network, we discovered that the month of September is also National Bourbon Heritage Month. In observance of National Bourbon Heritage Month, Mutineer is celebrating the history and art of distilling bourbon whisky by featuring a list of pretty rad blog posts about this amazing spirit. We also encourage you to visit Small Screen Network’s website and dig through their extensive archive of Bourbon videos, which includes mixology lessons from Mutineer Magazine contributorRobert Hess, an interview with Bill Samuels Jr. of Maker’s Mark, and even a recipe cooking with Bourbon. Find Small Screen Network on Twitter and Facebook. Torani Bacon Syrup Sure to Replace Galliano as the Bottle Behind the Bar That Will Never Need to be Replenished Torani Bacon Syrup. I dunno, maybe there’s a market for this? I do know that the Mutineers were as excited as could be to receive..."
Rip Van Winkle 13yr Deep tawny copper. Powerful caramel, spice, sweet tobacco, and estery aromas jump from the glass. A smooth, broad entry leads to a medium-to full-bodied palate with sweet toffee, roasted nut, and leather notes. Finishes with a wave of white pepper, spice, and long-lingering dried fruit flavors. A profoundly rich and oaky rye whiskey. Join our Whiskey Society to learn more about Whiskey’s at a discount! History: In 1988, Booker Noe introduced his own signature bourbon, Booker's True Barrel Bourbon. Inspired by a 200-year-old tradition, Booker's is the only bourbon bottled straight-from-the-barrel, uncut and unfiltered. First created as a holiday gift for his special friends, Booker's whiskey was so well-received that he decided to make it available to bourbon lovers worldwide; much to the joy of spirit connoisseurs everywhere. Booker's is the rarest, absolute best bourbon available. You can try this Whiskey at de Vere's Pub in downtown Sacramento. In 1876 the Watt family entered a horse, a Chestnut Colt, appropriately named "The Tyrconnell" in the Irish Classic horse race "The National Produce Stakes". Incredibly it won at 100 to 1. This spectacular achievement inspired the Watt Distillery to celebrate the occasion with a special commemorative Tyrconnell label, which remains to this day. Andrew A. Watt's distillery dates back to the glory whiskey days in Co. Derry in the North of Ireland. Derry’s suitability for whiskey production on a major scale due to copious supplies of good clean water, excellent supplies of local barely and the Derry mills to grind malt left it put her in an advantageous position. Originally from Ramelton in Co. Donegal the Watt family first settled in Derry in 1762. The Watt influence in Derry became substantial in 1839 when wine and spirit merchant Andrew A Watt bought the Waterside Distillery located in the Abbey Street area. One of the most significant decisions taken was to install the Coffey still, which was personally installed under Aeneas Coffey’s supervision. It proved to be a shrewd move as before long Abbey Street was the largest distillery on the island, capable of producing 2,000,000 gallons of whiskey a year. The firm focus on three main brands with Tyrconnell being their flagship brand. The Tyrconnell was, before prohibition, on of the biggest selling whiskey brands in the US. Pre-prohibition photos of Yankee stadium in New York show Tyrconnell billboards in positions of prominence at the venue. Tyrconnell and Andrew A Watts enjoyed great success in the export sector. Sales in England, Canada, Australia, Nigeria, The West Indies and the US put Derry on the commercial map of the world. By the turn of the century Watt amalgamated his interest with two other Belfast distilleries to form United Distillers Company. Things worked perfectly leveraging on their economies of scale until conflict arose between UDC and Scottish giants DCL based in Edinburgh. This was the beginning of the end for the huge Derry operation and Andrew Watt was forced to close the doors in 1925. The brands remained dormant till 1988 when Cooley Distillery acquired this old brand and went on its way to bringing this historical Irish whiskey brand back to life. Nose: Very scented, apple-skin dryness. Oily, cereal-grain. Palate: Light, oily, grassy. Lightly malty and cookie-like. Some vanilla sweetness. Finish: Crisp, clean. Hint of charcoal. Comment: A pleasant, light-tasting malt. Nose: Fresh, malty, and amazingly fruity. Loads of citrus and traces of apple. There is just a very faint touch of ammonia to this vatting, which is not normally the case. Palate: Intense malt with a distinctive, coppery richness. Spicy, with a fine sweet/dry balance. But the oak does start making a point. Finish: Dry and lacking true depth. Comment: Perhaps the most inconsistent brand from Cooley. Not the finest expression of its normally impressive single malt; usually there is greater clarity and depth.
" Rendezvous Rye is a blend of a 6 year old with 95% rye, and a 17 year-old that's 80% Rye. This would put it at one of the highest rye contents on the market, possible second only to Old Potrero's 100% (which if you ask me, is just a bit much). The Rendezvous Rye exhibits a maturity and sophistication I have never encountered in a Rye. It's age is certainly a factor in this, but it was obviously crafted with love and care. On the nose it is light and sweet, with only a hint of spice. The body starts with honey and jammy fruits, with herb notes, leading into an intense and lingering rye spice finish." Rye is back in style in a big way. And High West Distillery from Park City, Utah, is at the forefront of the resurgence, making small batch, hand-crafter spirits like this one. The 16 year is one of the most intensly "ryed" whiskies you will ever taste, with a mash bill of 80% rye, 10% corn and 10% barley. Like all High West whiskies, the 16 year old is not chill-filtered, which results in a spicy, and deliciously rich flavor profile that lingers long on the finish. Please note a slight hint of Coyote Mint. The 21 year old was aged in used oak barrels, which is very unusual for rye (almost all American-made whiskies are aged exclusively in new oak). Rather than the intense vanilla flavors imparted by new wood, the Rocky Mountain Rye showcases the peppery spiciness that distinguishes rye from corn or barley mash whiskies. With over 20 years in the barrel, the spirit is very delicious and very complex. Nose: Very linseedy, flowery and appetizing. Palate: Smooth, perfumy. Finish: Mustard. Comment: A classic Irish, though less full in flavour than Jameson. Nose: Grainy from the off, but just a little more pot still sturdiness than of yore. A touch fruity but overall quite uninspiring. Palate: Much more toffee-vanilla than in recent years; enormously soft and completely lacking richness. Finish: Dries as the oak takes over; becomes even bitter. Comment: An unwieldy blend which disappoints thanks to its refusal to offer anything but a grainy, almost metallic hardness against an uncomplex softness. Nose: Lemon-grass. Lime. Palate: Medium. Smooth. Sweetish, very toasty, malt character. Well-balanced. Finish: Nice balancing dryness. Leafy. Comment: Light but firm and satisfying. A welcome newcomer for everyday drinking. Nose: No shyness to the firm, extra-clean grain, but the malt does balance things out beautifully. The fruit has receded in recent years but there are still hints of apple and grape. Palate: Fabulously lush, honeyed and delicately malted. The grain adds complexity. Finish: Still lush, moderately sweet, slightly grapey. The early spices vanish and leave some oak and a grainy firmness. Comment: A satisfying, finely balanced dram which again shows Cooley’s decent grain to good effect. Nose: Gently fruity, perfumy, smoky. Palate: Light on the tongue. Flowery. Oat-like flavours. Some maltiness. Vanilla sweetness. Finish: Light. A touch of spiciness. Comment: The vinho verde colour suggests a very light whiskey, and this certainly is, in both body and flavour. This bottling seems markedly thinner than the last vintage I tasted. Nose: Attractive, obviously young but not immature. Grassy with a touch of muesli, sweet almonds and juicy malt. Sauvignon Blanc/green rhubarb ferment notes. Palate: Sweet and fresh all the way through: peaches, blossom and clover. Light nutty malt mid-palate with that winery/grapey note at the back. Finish: Peaches in syrup (en regalia?) then dry cereal. Comment: Hugely drinkable. Young but sweetly vibrant.